When I was a kid, I would sit for hours playing the LP record albums of my five older siblings, studying each album cover as if my life depended on committing every artistic nuance in it to memory. Of course that was back in the day, when the album cover ruled. Being the youngest of six children, I was fortunate to have three older brothers and two sisters, all with different taste in music. Which is why I believe to this day I have an eclectic palate when it comes to music, why I go through phases seeking out new bands/musicians, then obsessively listening to them. I then take to the internet to discover every thing there is to know about them, there music, their influences…Time I might have spent studying their album covers, if they were as relevant as they were back in the late sixties, early seventies. So as I find myself traveling southbound on a train leaving London thirty years later, the Battersea Power Station situated on the south bank of the Thames comes into view, memories come flooding into the reservoir of my conscious mind. I think about my brother Michael who was and still is a huge Pink Floyd fan. I see the album cover of Animals in my mind’s eye and I am transported to the living room at 1502 Ridgewood, Lakewood, Ohio. Sitting, or laying on the shag carpet before the hi fi stereo with headphones on, blocking out the late seventies world in which I traversed, listening to Pigs on the Wing. Amazingly the sky is the same shade of blue this day as it appears on the album cover. When I get to my hotel room in Petersfield, England where I have traveled to conduct historical research for the novel I am working on and tracing the journey of my own ancestors, I take to the internet where I discover the Battersea Power Station’s history. It breaks my heart to learn that it lingers on the verge of destruction due physical decay and lack of funds available for anyone who cares enough to develop. I learn that it is a decommissioned coal-fired power station build in the 1930’s, that it once boasted a beautiful art deco interior and that the station ceased generating electricity in 1983. Over the past fifty years the station has gained a degree of celebrity status making appearances in such things as the 1936 Alfred Hitchcock film Sabotage, the 1965 Beatles film Help!, and the more recent Batman film The Dark Knight just to name a few. Of course my frame of reference for this historical landmark will always be my brother Mike and his Pink Floyd album cover. 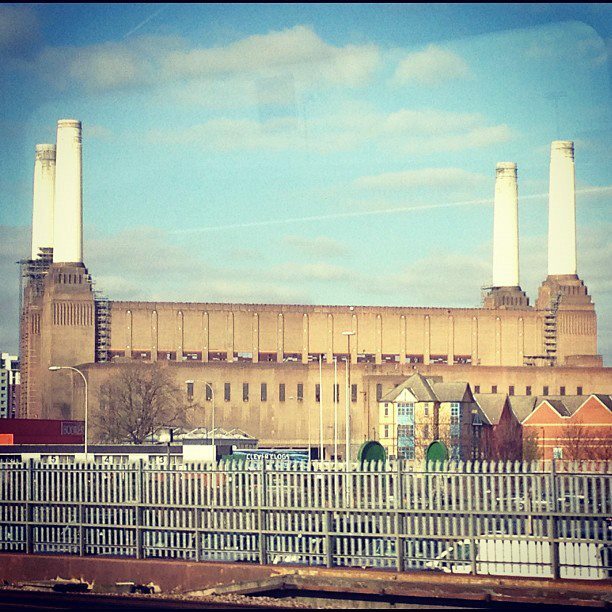 This entry was posted in american authors, film, History, literature, music, Uncategorized, writer, writing and tagged 1970s, 70s, album art, Animals, Anne Marie Cannon, Battersea Power Station, London, london landmarks, Pink Floyd, seventies. Bookmark the permalink. Hello, Fellow Blogger! I also hail from Ohio and am enjoying your engaging writing style. I look forward to following your future posts.